We backtested 10,000 cryptocurrency portfolios to find out. I attempted to answer this in my last article by simulating 100,000 portfolios using the Monte Carlo method and found more frequent rebalancing did not have any effect. But, many of my readers & followers were not satisfied. A lot of investors are under the impression that there is something special about the cryptocurrency market?—?something that gives an edge to more frequent rebalancing. I’ve never been one to shy away from data. 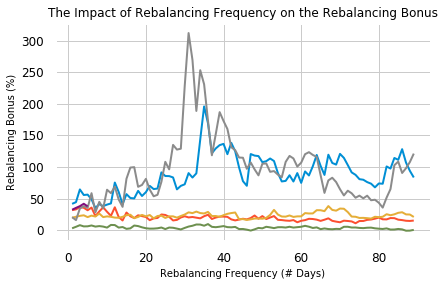 So in this article, I will be investigating the impact of rebalancing frequency on portfolio returns by running backtests on historical cryptocurrency market data. For this case study, we’re going to generate 10,000 random, evenly-distributed, portfolios and backtest each portfolio across a large range of different rebalancing frequencies (1 to 90 days). After each backtest, we’ll record the rebalancing bonus, which we’ll define as the excess return the rebalanced portfolio produces over the drifting one. Monthly, Weekly, Daily… Does it Matter? If having shorter rebalancing periods improved the rebalancing bonus, we’d be able to fit a trend line from the top-left to the bottom-right of our graph. But that’s clearly not what we see. 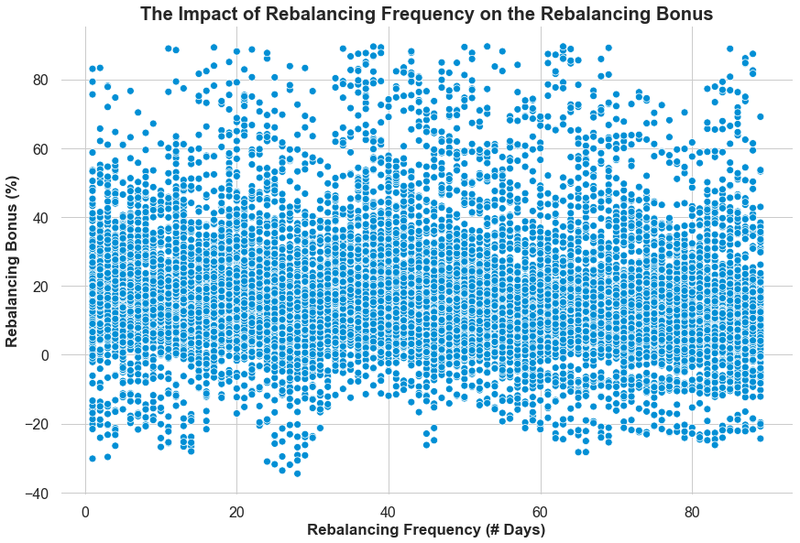 In aggregate, we observed no relationship between rebalancing frequency and rebalancing bonus. That is not to say, that changing the rebalancing frequency on a specific portfolio has no effect. Quite the contrary. When we take a portfolio and change the rebalancing frequency, we end up with a different rebalancing bonus for each period. 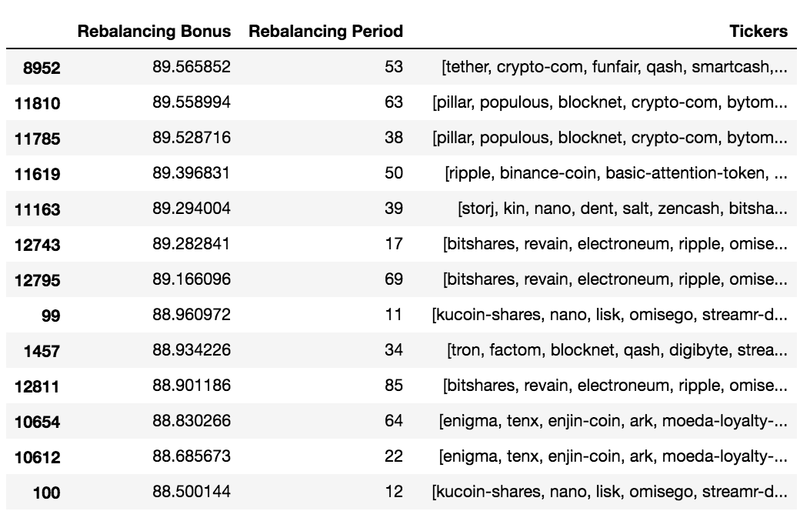 Rebalancing Bonus for the 5 different portfolios across different rebalancing periods. Each portfolio is denoted by a different colour. The problem is that there is no general rule for all portfolios. Every portfolio has its own ideal rebalancing period that is based on the price movements of its underlying assets. One portfolio’s ideal period could be 78 days, while another is 3 days. If we take a look at our simulations, we’ll see that the highest rebalancing bonus values come from a mixed bag of different rebalancing periods. While we can evaluate what the best rebalancing frequency would have been, but there’s no guarantee that will continue the best one going into the future. We don’t have the ability to predict the ideal rebalancing period ahead of time. To do so would require an uncanny amount of insight regarding the volatility, correlation, and price behaviour of the underlying assets. If any trader could predict the future with such a high level of precision & accuracy, there are better ways to make money, compared to trying to choose the best rebalancing period. Rebalancing vs. HODL?—?Which Strategy Drives Higher Crypto Portfolio Returns?